We were up early in Louisiana hoping for a fast start as it was going to be a 300 mile day. We typically average about 50 mph including stops and 6 hours of towing a 37′ trailer is enough, thank you! So it was disappointing to find fog when we popped outside. I charged on hoping for the best. By the time we had said our goodbyes and were pulling out of our site the visibility had increased to about 1/2 mile. As we headed east the fog kept thinning and after 30 minutes it was nothing but a bad memory. A portion of I-12, where I-10 re-joins east of New Orleans, is in terrible shape. We hit a section without cautionary speed signs that had the truck and trailer flying in opposing directions (I think they call this “chucking”). I needed to slow but had a big 18-wheeler bearing down on us. He wasn’t having a problem, but we certainly were! When we arrived at the campground I started unhitching and discovered that, in addition to dumping all our clothes off the bar and opening cabinet doors, the 5/8″diameter electrical cable (it connects the truck brakes to the trailer brakes and tail/brake lights) had become trapped under the base of the trailer hitch… a space the cable normally would never fit into. The hitch weighs about 300# and the weight from the front of the trailer is another 2,000#. With over 1 ton mashing the cable I was worried the the insulation might fail. It took the better part of an hour but I finally got enough slack into the cable to unhitch, then used a pry bar to lift the hitch enough to get the cable dislodged. This KOA had assigned us to one of their 3 “super sites”, a really nice site adjacent to the office, showers and laundry. After all the drama with the cable, I joined the Brown Knee Society. The BKS is an exclusive organization composed of travelers who have opened the sewer cap on their RV in order to connect the flexible sewer line only to find some idiot (that would be me!) had left the holding tank drain valve open, then used the toilet enroute to the next campground. If you’re uncertain what happened next, watch Robin Williams’ movie RV. It wasn’t pretty. The Admiral wouldn’t let me into the coach to change clothes (Admirals are like that). Instead she passed a garbage bag to me filled with clean pants, laundry detergent and my towel and shower gear, then sent me on my way with her best wishes. Let me tell you, guys, no one loves you when you’ve been kneeling in the family poop! The campground in Gulf Shores, AL, across the bridge from Pensacola, FL, turned out to have a great location on Perdido (Hidden) Bay. 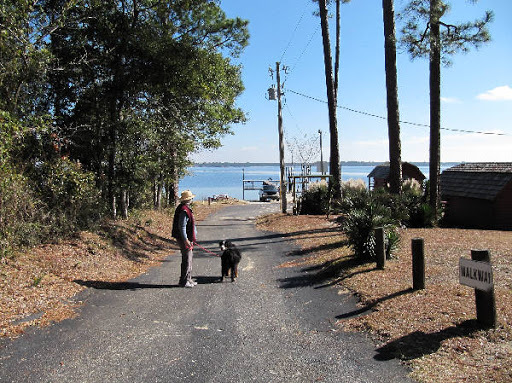 We couldn’t see it for the trees when we arrived, but we were right on Perdido Bay. A short walk down a nearby trail had us on the beach.It would have been a great stop, but sadly the toilets & showers are not Admiral approved! 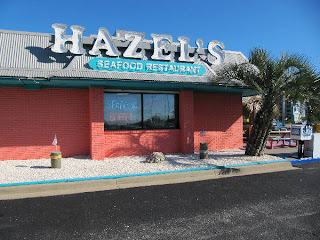 We found a pretty good restaurant along the strand called Hazel’s. So did every other visitor over the age of 65 and they all were there for the inexpensive buffet. And it was pretty good, too. 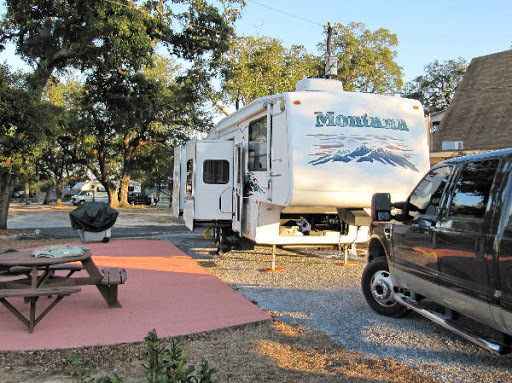 PS- most folks know what a mobile home is and presume that “mobile” refers to the fact they are gotten to their destination by towing them, making them mobile. The reality is something different and one of those mostly-forgotten bits of Americana. After WWII, the home building industry could not come close to keeping up with demand for housing. Modular homes – houses built in a factory then delivered to the home site on the bed of a truck – were the short term solution (and still a popular product everywhere, especially in New Mexico). They were inexpensive and could be built much faster in a factory than carpenters working on a job site. They did, however, require a large truck to get the modular home to the site. An innovative builder of modular homes in Mobile, Alabama named Mobile Homes hit upon the idea of building the modular home on top of a metal frame with axles and a removable hitch. This not only eliminated the need to use large trucks, but it also made the home maneuverable for positioning in the their final location. And the design allowed the use of cheaper materials. Just connect the finished home to a smaller truck with a stout hitch and away you go. Not sufficiently durable to be used as a travel trailer, but moveable none the less. The corporate name Mobile Homes was just too convenient and non-specific to retain its corporate roots and mobile home became the noun of choice to describe ultra-light modular homes delivered on integral axles. So the next time you see a “mobile home”, remember that you’re celebrating the industrial genius of a company in Mobile, Alabama. This entry was posted in Uncategorized and tagged Brown Knee Society, I-10, KOA, mobile home, Perdido Bay. Bookmark the permalink.